You are here: Home / Our Blog / Helpful Resources / What is Title Insurance, Why is it Necessary, and Who Needs it? Many people view title insurance as just an indeterminate charge that shows up in the paperwork associated with loan closing. It often doesn’t receive a closer look by clients. At some point during the closing process, the lender will likely tell the client that title insurance in St George is required, the client will agree, and that will be it. It’s important to understand, however, that title insurance is extremely important. Here, we’ll give a brief explanation of what title insurance in St George is, how it works, and how much it costs. Title insurance is protection against potential financial losses that have to do with property ownership. With it, the insured is protected against all sorts of possible scenarios. There are two different policies that come into play when discussing title insurance in St George: a lender’s policy and an owner’s policy. Both require a one-time-only payment; no monthly payments. If the title company finds that the property the client is purchasing has a clear title, meaning there are no title defects or legal claims against it (such as past due taxes, liens from past lenders, or levies from creditors, for example), many wonder why title insurance in St George would be necessary. 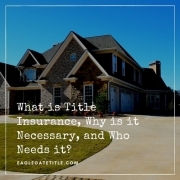 It is necessary because future incidents could very well occur that would make title insurance in St George invaluable, even many years later. Examples include but are not limited to an unknown pending lawsuit (or legal judgement), a previously unknown heir, title researcher oversight, or an ownership history mistake. Some type of fraudulent title issue is also not outside the realm of possibility. If one of these scenarios shows itself at any time in the duration of your ownership, title insurance in St George will provide assistance with associated legal costs and much more. Lenders have an obvious interest in their clients maintaining title insurance in St George since the lenders are “on the hook”, so to speak, for the value of the home, particularly in the mortgage’s first few years. Every transaction that involves a mortgage requires both a lender’s and owner’s policy. The buyer generally pays for the lender’s policy and the seller pays for the owner’s policy. In the case of a cash transaction, only an owner’s policy is required which is generally paid for by the seller because there is no lender involved. There simply is no way to know what could happen at any point in the future in regards to the title of a property you purchase. You will definitely sleep better at night knowing that if something did happen, your equity and your down payment would not be at risk due to title insurance in St George. In some cases, you can negotiate with the seller and have them pay for both policies. However, if payment responsibility falls on your shoulders, it is more than likely that it won’t cost much. Depending on what state you live in, the cost of these policies can vary. The average cost for title insurance is between $1,000-$4,000. It is also important to note that many states regulate these costs, meaning there wouldn’t be a better deal to be had at a different title company. Call Eagle Gate Title or visit our website for answers to any further questions that you may have about title insurance in St George. We promise to be honest, friendly, and forthcoming in all of our communication with both potential and current clients. We have seen title insurance save the day for so many people and always want our clients to understand the benefits of having it. http://eaglegatetitle.com/wp-content/uploads/2019/02/st-george-title-companies3.jpg 500 500 aloha http://eaglegatetitle.com/wp-content/uploads/2019/02/logo-300x212.png aloha2019-02-26 16:56:492019-02-27 19:24:25What is Title Insurance, Why is it Necessary, and Who Needs it?